Both vegetable and flower gardening are most rewarding. There’s nothing more satisfying in this world than creating something and being able to actually see, feel or smell it. Your marvelous creation simply came from a seed or transplant. No one knows the behind scenes details that went into creating that flower or squash but, you do. You know that with your labor of love comes the possibility of injury. 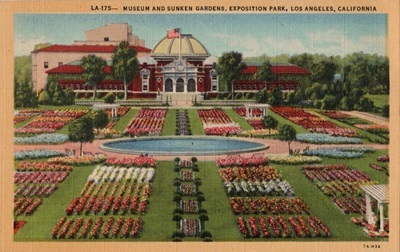 You toughed the weather, the backaches, lugging, hauling, pulling, kneeling, standing, stretching and lifting for long hours, with occasional bouts of dehydration; yet, you had a mission.. a vision of making beauty and creating a bountiful harvest of fresh flowers, fruits and vegetables. You did it and I hope that you did it the right way. 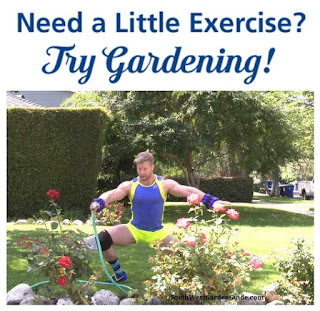 Gardening is exercise. 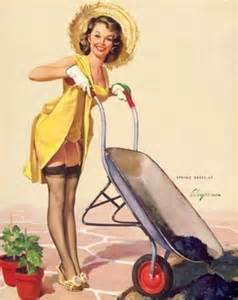 In the beginning, gardening can be rugged, tough and down- right hell on three wheels. Each season there’s plenty of physical work to be done like having to till or turn over soil, pull weeds, haul in manure, tug around bags, containers, wheel barrels and hoses. You’re a regular mule. Planting seeds, pulling weeds or tugging garden hoses can all simulate exercises as like lunges, bends, squats, pull and even push-ups and pull-ups. Before you begin your day of gardening you should prepare yourself for the usual lifts, bends, lunges and pulls that are all a part of general gardening. Always warm your muscles by moving. You can walk in place, stretch, punch, act like you're pulling a lawn mower cord, simulate walking steps or even pretending to hula hoop. It's always best to warm your body up a bit before heading outside to do manual labor. This will prevent injury to muscles which can cause everything from backaches to charlie horses. 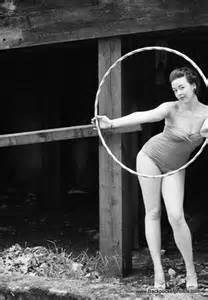 Pretending to hula hoop is a great exercise to loosen leg, hip, and back muscles. Stand with your hands on your hips. Slowly turn your upper body as far as possible to the left for a count of 5. Turn to the right and hold for a count of 5. Stand with your back straight and arms to your sides. Stretch arms straight out in front of you and hold for a count of 5. Return arms to sides. Repeat 10 times. Now, stretch arms straight in back of you until shoulder blades touch. Hold for a count of 5. If you must kneel, stand up and stretch frequently to avoid stiffness. Use garden knee pads or a pillow to absorb the pressure on your knees. Also, lean on your hands so that your arms absorb some of the shock. Make sure the object - like a sack of mulch - is not too heavy to lift. Test its weight by lifting one corner. Roll or push, rather than carry, heavy loads. Pull an object by placing your feet apart, bending your knees, and leaning away from the object. Pull by straightening your legs. Always face the object and keep your back straight. Always bend at the knee. When pulling weeds, it's best to squat rather than bend at the waist. This will keep your knees limber and it will prevent light headiness and back muscle strain. When gripping weeds or plants, use a firm grip with your fist facing up as if you're going to pound something. Wrong garden shoes can actually create injury through out your body. Shoes should be lose fitting yet tied snug at the ankle. Fallen arches, corns, calluses, bunions and hammer toes are all caused from wearing the wrong shoe size. Gardening equipment should suit your size, build, and physical capabilities. If you have arthritis in your hands, use garden tools with enlarged handles. Long handles on garden tools ease the strain on an arthritic back. Using vinegar as a garden tool can cut physical labor in half. Why spend hours standing and bending when you can use a bottle of vinegar to kill weeds, fungus and aphids? Use full strength apple cider vinegar or white vinegar poured onto stubborn weeds can kill the weeds without poisoning the soil around them. Sometimes pulling weeds can be back breaking work. Put some vinegar in a spray bottle and spritz the tough weed. In a day or so the weed will die at the root level. You can use a diluted vinegar solution (1:8 ratio of vinegar to water) to raise the acidity in your soil for azaleas and rhododendrons to thrive in, and if you dilute that even further and add some sugar to the mixture, you have home made plant food. 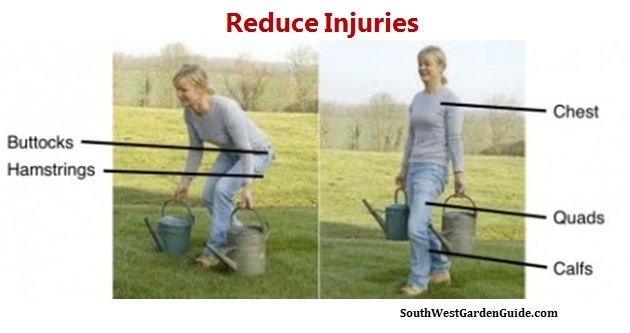 Many times adding bags of soil can having to turn it over and over can put a lot of strain on muscles. Try using the vinegar and water solution if you don't feel ling pulling out the shovel and bag of potting soil. Add a few tablespoons of vinegar to a gallon of water and then transfer it to a spray bottle; you can use this spray to treat black rot and fungus issues on roses, and to fend off aphids. Many times we stand there for an hour or so clipping away the black rot and fungus effected leaves. Our feet hurt and lower back often ache from standing in one place for too long. Using simple tools as like a spray bottle with vinegar in it can really cut gardening time down. When you’re able to finally see the beautiful results of all your sweat and labor, you know that every ache and pain was well worth it. It’s even more satisfying to awe your family, friends and neighbors when they see that marvelous garden or lawn that you’ve nurtured all by yourself. You soon forget about all of the physical labor that it took to get you to that appreciation. Remember to at least do a bit of warming up before you head outside to do all the manual labor that comes with outdoor gardening. You’ll be glad you did as time goes by. As like any sport or exercise, injuries, wear and tear on the joints or not doing proper exercise moves will eventually catch up to you.